Hope you all had a nice weekend and that all the mom’s had a great Mother’s Day! Today’s card share is a simple card to make but yet is elegant. In my opinion, layering white on white creates a classy looking card. Approximately 2/3s of the top card layer is texture embossed with the Lovely Lace Textured Impressions Embossing Folder, thus leaving enough non-embossed card to stamp the sentiment. The card base uses the Whisper White Thick card stock and the embossed layer is the regular Whisper White card stock. The weight of the Whisper White Thick card stock is perfect for a card base. 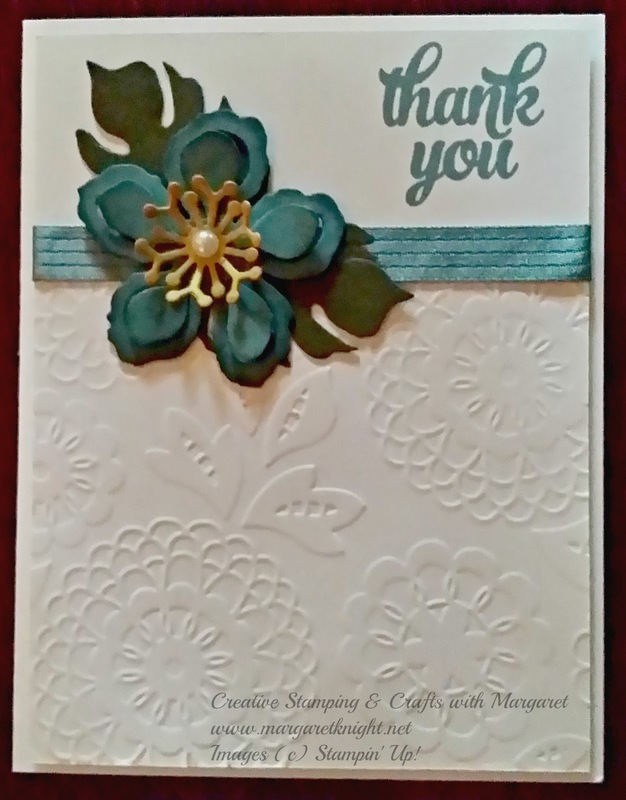 Since I am in need of a thank you card, I chose the sentiment from the Tin of Cards photopolymer stamp set and stamped it using Lost Lagoon ink. (going to miss this color when it retires at month’s end!) The Botanical Builder Framelits Dies was used to cut the flower and leaves. The touch of color by adding the flower elevates the card…though I must say, just the embossed white with a stamped sentiment looked nice too! The edges of the flower were sponged with Lost Lagoon ink to add additional dimension. The Lost Lagoon ribbon is discontinued and can be omitted but some substitutions include white ribbon colored with the desired ink color or adding a strip of washi tape. 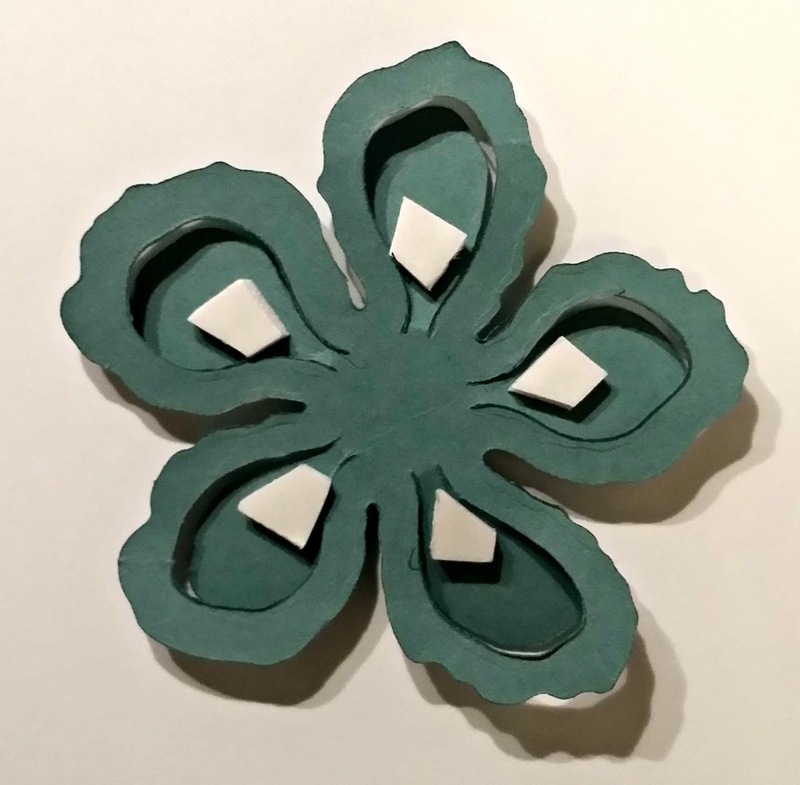 To keep the flower petals lifted, a stampin’ dimensional was cut into quarters and each piece was placed near each petal base (photo is below). The Hostess Code for May is VE2K2TG4. Use this code if your order is less than $150. If your order exceeds $150, you will receive Hostess Rewards. Visit the Shop Now tab at the top of my blog post to place your order. I will be hosting a “live” Monday Night Mania Class. Details: There will be a card demonstration & gift tag demonstration, games & prizes. More information as the date nears. Thanks for stopping by and don’t hesitate to contact me with your questions.